Fisherman generally uses kerosene lanterns to attract fish to their boats, much the way light bulbs attract moths. Although this fishing method brings the most fish and the most income, accidents are not uncommon. An electrician in Abu Dhabi has invented a high-powered solar lamp that can also be charged by a fishing boat engine. P.K. Mohankumar from Kerala, India, said his battery-operated lamp named ‘Sea Tec’ can last up to 24 hours and is perfect for fishermen making long sea trips. The uniqueness of this solar lamp - It’s waterproof, rust-free and cost-effective which is ideal for fishermen. “The body of the lamp is made of polyvinyl chloride (PVC) to keep it waterproof and rust free. The battery unit is made of fibreglass packing to prevent any potential damage by sea water,” said the 48-year-old who works for the Equestrian Club in Abu Dhabi. Sea Tec has holders on the sides and a dry battery in the unit is used to power a compact fluorescent lamp. 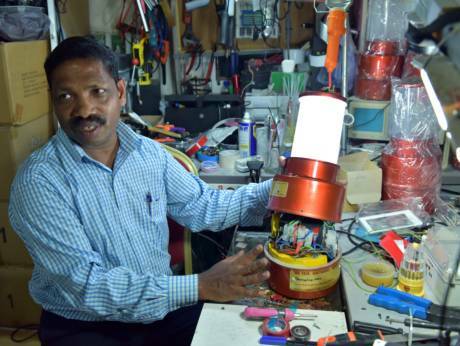 Mohankumar, who has been repairing electronic gadgets for 20 years, claims unlike other lamps, Sea Tec needs only six hours to be fully charged. “It took me more than a year to design the circuit and battery of the lamp. I had earlier made a lamp that could last up to 16 hours,” he said. Mohankumar says his lantern could be a handy device for fishermen as it’s both cheap and efficient. “Since the lamp is solar-operated, it can be used in places where there is no electricity,” he added. The lamp weighs around 7kg and can also be charged with an electrical socket. Mohankumar said the challenge is to keep the cost low so that people can afford it. “It costs Dh700 and I am already getting orders from Egypt and India,” said the electrician who is planning to apply for a patent for Sea Tec. Our world has already invented many effective poverty solutions, but sadly most fail to reach actual people in need. Millions of lives would improve if people had access to proven energy, education, health, and other interventions. We need low cost, reliable Inventions which could be used by the poorer of the poor for meet their two ends of life. P.K. Mohankumar's Invention is really an innovative solution that could be directly used by fishermen around the world. Again, a right step at right direction as far as implementation of renewable energy is concerned.